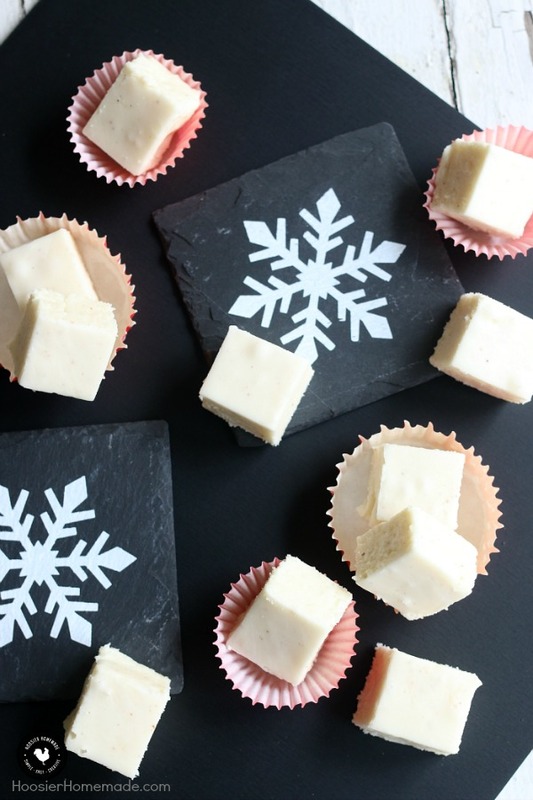 The perfect holiday treat to make and share as gifts – this Eggnog Fudge is easy to make, goes together quickly and is made with Dairy Free Eggnog! Whip up a batch to share with friends, teachers, neighbors, co-workers and more! The holidays for our family are all about tradition – from putting the ornaments on the family tree, to everyone getting new pajamas on Christmas Eve, to the desserts we enjoy. My Mom used to make fudge every year for Christmas, she would give it as gifts, but also add it to her dessert platters that we all loved. Although she made many different kinds of fudge, I don’t remember her ever making Eggnog Fudge. Years ago, many of the desserts that we enjoyed were the “traditional” ones like chocolate fudge or apple crisp. I love how all that has changed and we can incorporate different flavors into our baking. Eggnog is one of those flavors that you normally don’t think of incorporating into dessert. Eggnog is often enjoyed by itself around the holidays, either warm or cold. This year – let’s change that. During the holidays, I like to indulge a little more than I normally would. But over the last several months, I have discovered that I feel a lot better if I stay away from dairy. When thinking about the upcoming holidays, I knew this would be a struggle. Of course, everything that I love has dairy. But then I was introduced to a whole new product that saved the day. I’ll tell you my secret. Silk Nog! After discovering this deliciousness, it’s one of my favorite food items around the holidays. You can imagine how excited I was when I found out that Silk Nog actually expanded their product line. Now there is Silk Soy Nog Original, Silk Almond Nog Pumpkin Spice and Silk Almond Nog Original. I love not feeling naughty about what I consume around the holidays. We all know there’s plenty of goodies we consume that does make us feel a little guilty. 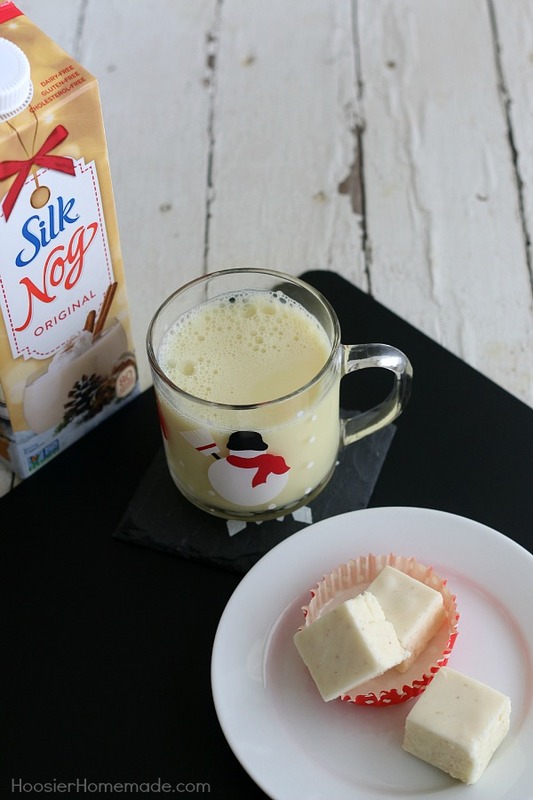 The reason you can consume Silk Nog without feeling naughty is because it’s made WITHOUT eggs, dairy, or saturated fat. Incorporating the Silk Nog into the Eggnog Fudge recipe worked perfectly. It’s so creamy, yummy, and you can’t stop with just one. And to be honest, I don’t always stop with just one. The fudge is not totally dairy free though, although you can find white chocolate chips that are dairy free and also a butter substitute. So if you are looking for a special treat that is totally dairy free, I would suggest looking for the dairy free white chocolate chips and a butter substitute. 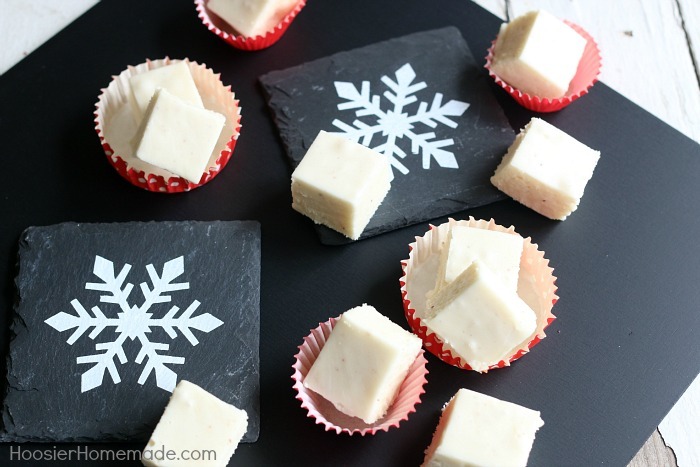 This Eggnog Fudge makes the perfect Christmas gift as well, it’s a frugal and delicious way to tell your friends and family that you love them. Also, some of our friends and family are allergic to dairy and eggs, so it’s a win-win for them, considering Silk Nogs are dairy-free. I’m going to share my yummy recipe with you, but you can also visit www.silk.com/holidays for recipes, a free digital holiday recipe book, a coupon, and more! The perfect holiday treat to make and share as gifts - this Eggnog Fudge is EASY to make, goes together quickly AND is made with Dairy FREE Eggnog! Whip up a batch to share with friends, teachers, neighbors, co-workers and more! We made the recipe totally dairy free by using Earth Balance margarine, Kind David dairy-free white chocolate chips, and of course Silk soy nog. My milk allergic son absolutely loves it, it’s his new favorite holiday recipe. That’s awesome Janet! Thanks so much for letting me know! UMMM you need to revamp your listing… it can’t be DAIRY free if you are using BUTTER. Hi Julie, thank you for your comment. The fudge is not dairy free. What I said was – it is made with Dairy Free Eggnog. I didn’t see where the marshmallow creme or the rum extract were used in the recipe. Can we get a corrected recipe instruction or a corrected ingredient list please? This sounds delicious! I’m so sorry, I totally missed that step. I have corrected the recipe. Stir in the marshmallow creme and rum extract after the chocolate chips are melted. I saw your feature on Two Cup Tuesday. Congrats! This looks very very good. Pinning! Looks Delicious! My daughter loves eggnog she’s going to love this recipe! Thanks for linking up to Merry Monday! Sharing on FB! Have a great Thanksgiving! Oh MAN this looks amazing! 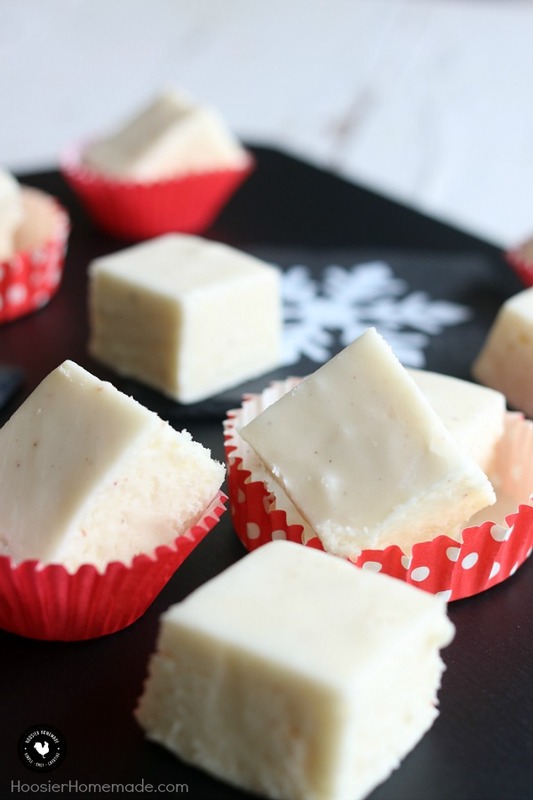 Pinning it… thanks for sharing, I had never thought of making egg nog fudge before! !